On this episode of People of Tech, Charles is joined by Philip Blake, the Country Manager (UK and EU) of EC-Council, the world’s largest certification body for Ethical Hacking and Advanced Information Security Training. Philip has been working at EC-Council since 2016. His employers are the suppliers of cybersecurity training including leadership training courses for IT professionals. 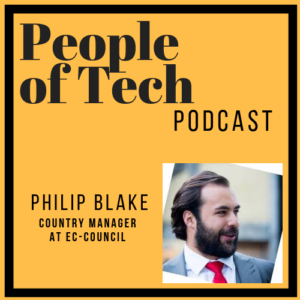 In the podcast, Philip discusses his career to date, explains more about what EC-Council provide to their customers and gives his opinion on the current threat landscape in regards to how we can protect ourselves and our organisations. 07:36 What is Ethical Hacking? 15:25 Who are EC-Council’s customers? 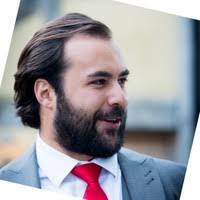 19:04 Is Blockchain the next big step in cybersecurity? 24:05 Trends in the current threat landscape. 30:31 Philip’s opinion on the main cybersecurity threats and how to stop them. 35:34 Advice on cybersecurity basics. 39:08 How do you switch off?